An action-packed 25th season of Bojangles' Summer Shootout grassroots racing roars to life on Monday and Tuesday, as a two-day extravaganza of quad racing, area principal school bus slobberknockers and a double dose of Legend Cars and Bandoleros race around Charlotte Motor Speedway's frontstretch quarter-mile. 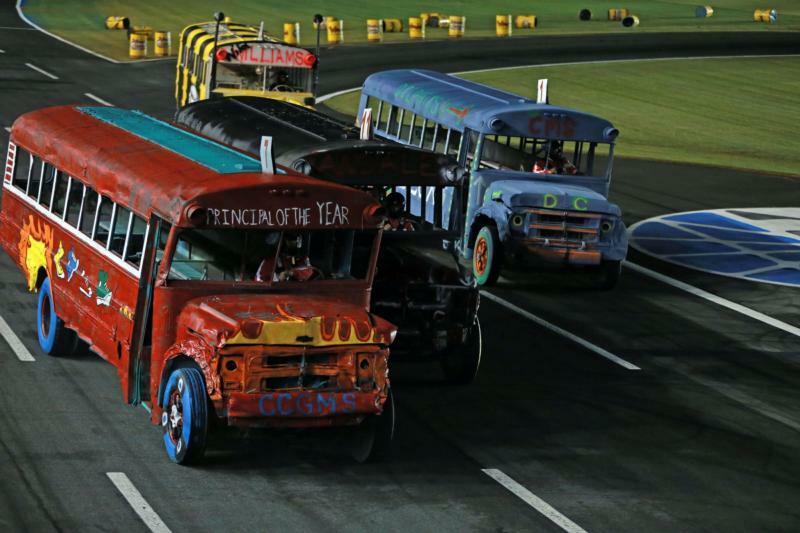 The opening chapter of family-friendly entertainment at the Bojangles' Summer Shootout includes a quad race on Monday to lead up to Tuesday's showdown for the title of "Head of Class." John Motley Morehead STEM Academy Assistant Principal Charlie Copeland claimed the championship belt with a late-race pass in last year's heated battle of the buses, but Copeland will have to take down another recent champion this season. W.M. Irvin Elementary Principal Tonya Williams, the 2016 winner, will chase her second victory in the last three years. "I'm very excited about racing again," Williams said. "I'm looking forward to bringing that beautiful championship belt home to W.M. Irvin Elementary. Racing those school buses is a lot of fun and it's great entertainment at the same time. I love being a part of it." Copeland believes he has the right stuff to take his opponents to school in Tuesday's two-ton tussle of buses. "After last year's rain delay and racing on a wet track, I'm looking forward to a race on a dry track so no principals can make up excuses this year," Copeland said. "My goal is to stay on the inside and keep the tires on the ground in the turns." The Bojangles' Summer Shootout features exhilarating short-track action among Legend Cars and Bandoleros chasing championships in the world's ultimate grassroots racing experience. This year's field includes more than 130 cars.